Update: 8/4: Because of low enrollment, this course will not be running in Fall 2015. 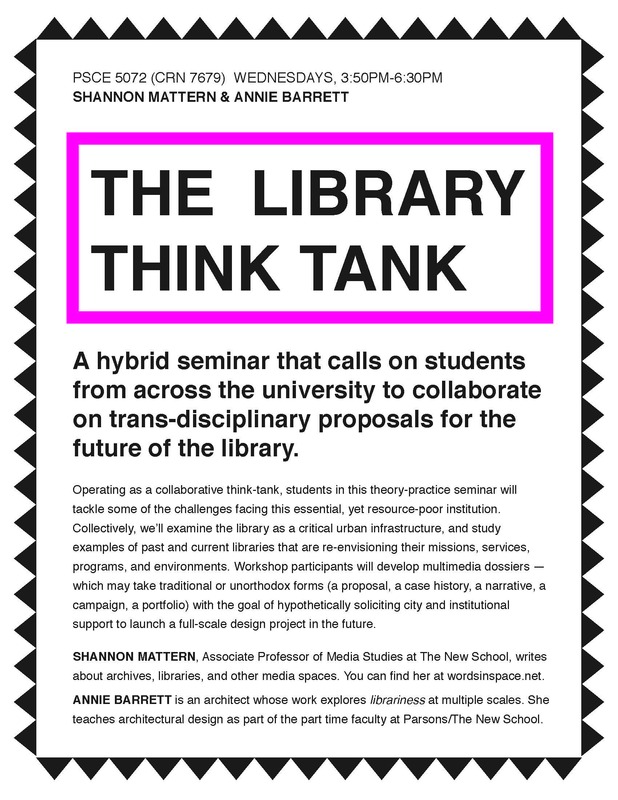 I’m super-excited to be partnering with the fabulous architect Annie Barrett — leader of the UNION team from our 2014 Architecture League / Center for an Urban Future branch library design study — to teach LIBRARY THINK TANK, a Fall 2015 hybrid seminar/studio [pdf]. I’m thinking of this as a hands-on extension of the Archives/ Libraries/ Databases seminar I’ve been teaching since 2011 (and which I’ve been invited to share with folks at the Library of Congress and MoMA; librarian-extraordinarire Rick Prelinger kindly bestowed his blessings, too :-). I’ll likely return to this class in Fall 2016. For this new studio iteration, though, I’m very much looking forward to the new opportunities made possible through the collaboration with Annie, and by (ideally) bringing together methodologies and perspectives — and students! — from diverse disciplines and programs. We’re hoping students will be excited to extend the excellent work begun by the Center for an Urban Future (an urban policy think-tank, and author of influential reports on NYC’s branch libraries, published in 2013 and 2014) and developed through our 2014-15 CUF/Architectural League design study, which attracted attention from the New York Times, Curbed, Next City, City Lab, and other publications, and has informed City Council deliberations. The Think Tank is housed in Parsons’ M.Arch. program, but it’s open to graduate students — and advanced, qualified undergraduates — from all across the university. We want to build strong interdisciplinary teams to develop strong, inventive library design proposals. Amidst radical technological, socio-political, and cultural shifts, our libraries are in a state of transformation — yet they continue to play critical roles in our civic, intellectual, and professional lives. Reassessing and redirecting the future of this vital institution requires progressive thinking from social scientists, humanists, data analysts, information scientists, and design-thinkers operating at all scales, from architecture and urbanism to creators of interiors, interactions, communication, and services. 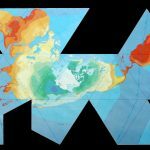 This hybrid theory-practice seminar calls on students from across the university to collaborate on the development of trans-disciplinary proposals for the future of the library. Operating as a collaborative think-tank, students will tackle some of the challenges facing this essential, yet resource-poor institution. Collectively, we’ll examine the library — past, present, and future — as a critical urban infrastructure, and study various past and current examples of libraries that are re-envisioning their missions, services, programs, and environments. Workshop participants will develop multimedia dossiers — which may take traditional or unorthodox forms: a proposal, a case history, a narrative, a campaign, a portfolio — with the goal of hypothetically soliciting city and institutional support to launch a full-scale design project in the future. Open to all university graduate degree students and upper level undergraduate students by permission only. Pre-requisite(s): none.